Bahamas: News: Archive: HG Christie - "Best of The Bahamas"
HG Christie - "Best of The Bahamas"
The Bahamas Web Awards is the first leading national honour for the Best among Bahamian Web sites. John Christie left the First Annual Bahamas Web Awards Ceremony a happy man, and for good reasons.� His Web site, www.hgchristie.com, won three top Awards, including the coveted Best of The Bahamas Award. 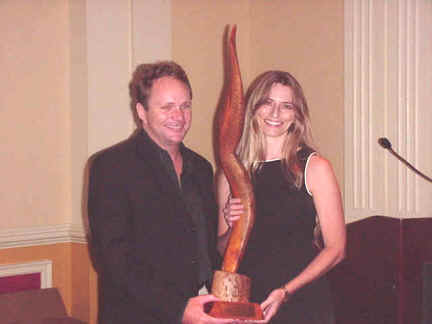 The Best of the Bahamas Award, a sleek and graceful custom designed sculpture trophy was created exclusively for the Bahamas Web Awards by Bahamian artist and sculptor Antonius Roberts. The Christie Web site also won the Programmer Award and the Judge's top award for the non-tourism category. John Christie said "We're very proud of our award. As a company, we have put alot of time and energy into our website HGChristie.com and it is great to finally be recognized as the best in the Bahamas." In accepting the top award, Mr. Christie thanked the contest producers, BahamasB2B, for helping to raise the standards of Bahamian Web design and for forging an online community which has assisted in the development of the Internet in The Bahamas. "I would like to thank Bahamas B2B for hosting the awards and making them such a success. They are an energizing force in the Bahamas online community and we really appreciate Bahamas B2B.com as a strong resource for our company," said Mr. Christie. The contest started in March with a Call for Entries, followed by the online People's Choice voting and the Judges voting. BahamasB2B wrapped up the six-month long Awards contest with a ceremony last night that saw the presentation of 14 awards for the best Web sites in the Bahamas. Barrington Brennen, webmaster for the The Bahamas Conference of Seventh-day Adventists, accepted the top honour in the People's Choice voting for his site, www.bahamasconference.org.� The site also won the top award for the non-tourism category in the People's Choice voting. The audience was absolutely "wowed" by three of the top Bahamian performers; Tony Seymour Jr., TRez Hepburn and surprise guest Sweet Emily.� Also on hand were two rising stars in the Bahamian entertainment scene, Keno Thurston and Blue Spinx, whose opening rap tribute to the Bahamas Web Awards truly delighted the crowd. The top Award was presented, on behalf of BahamasB2B, by Lisa Wells, from the leading Web Design firm, Benelda.com.� Ms. Wells received a rousing round of applause for her dedication and enormous contribution, over the past three years, to the Bahamian Internet community. Special Guest Star, Greg Lampkin from LOVE97-FM was on hand to explain the rules and criteria.� He praised BahamasB2B's leadership in the Bahamian Web industry and their dedication to recognising excellence and showcasing new talent in the Web design field. Peace & Plenty's Barry Benjamin was in town from Exuma to accept two awards for his Web site, peaceandplenty.com.� Mr. Benjamin's site won the Judge's top honour in the Tourism category and also the Designer Award for the best designed Web site. Captain Mike Russell accepted the People's Choice Award in the Tourism Category for his excellent website for Chubasco Charters Sportfishing. 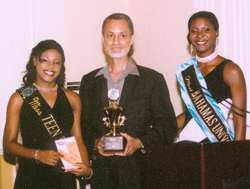 Cedric Storr, from Roots Junkanoo, won the Bahamian Designer Award for his Web site, www.rootsjunkanoo.com. Abaconian Mike Bodamer, who was unable to attend the Ceremony, won the Bahamian Programmer award for his Web site, www.abacoinfo.com. Erik Russell's keeniphoto.com was the winner of the Judge's Selection Award in the Amateur Designed Category, and also won the People's Choice Award for that category. Reg & Kit won the top award in both the People's Choice voting and the Judge's Selection in the Personal pages Category for their wonderful Reg & Kit's Friends of The Bahamas Home Page. In the audience were numerous leaders of the Bahamian community including top union leader Pat Bain, Web Awards Judge Felix Stubbs and his associate Errol Bodie from IBM, Henry Lightbourne from The College of The Bahamas, Colin Marshall from the Ministry of Works and others.